"We unequivocally condemn today's murderous terrorist attack against the Russian ambassador in Ankara, Andrey Karlov," says a statement released tonight by the Greek foreign ministry. The ministry called it a "barbaric act, which caused the tragic death of a diplomat, whose job by definition is to promote peace and dialogue"
The conservative, opposition New Democracy released a statement calling the assassination "one more terrorist act in the neighbouring country, which deepens uncertainty and instability in the region." ATHENS, Greece – Greece’s leftwing government has announced its first counter-austerity measures in over a year, only to incur the wrath of creditors and beneficiaries alike. Prime Minister Alexis Tsipras was hard at work convincing his Eurozone partners at Wednesday’s European Union summit that his measures are affordable. They are now his biggest creditors, owning $220bn of Greek debt. They said on Tuesday that they were suspending debt relief worth $47bn, until Greece assures them it is toeing the line on agreed spending limits. Meanwhile in Athens pensioners were furious that the government’s planned handout to them is paltry. Tsipras says he will spend $650mn on 1.6 million pensioners earning under $30 a day. Most of them earn less than the poverty level of $23 a day. Their pensions have been cut by between 20 and 50 percent since austerity began in 2010. With official unemployment still running at 22.6 percent, some studies find that about half of all households rely in whole or in part on income from pensions. Tzobanos’ pension was cut from 35 dollars a day to 20 - a living he shares with an unemployed son. Despite the objections, parliament approved the handout by a two-thirds majority – far greater than the 153 seat government majority in the 300-seat chamber. The package also includes delaying a sales tax hike on eastern Aegean islands, which have born the brunt of the crisis. The government says its handouts don’t cost more than 750 million dollars, and it can handily afford them because tax revenues this year are more than four billion dollars above target. That puts Greece in line to achieve a primary surplus of $7.8bn, far above the targeted $3.6bn. The government sees this handout, along with two and a half thousand new jobs in health and education on the islands, as a much-needed stimulus to the economy. On December 5 the Eurozone lengthened Greece’s repayment on some of its debt and adjusted its interest. The measures fall far short of a 50 percent debt restructuring recommended by the International Monetary Fund, but they would achieve an estimated 20 percent reduction of Greece’s debt burden by 2060. All this has now been suspended pending a review of the latest measures. After 16 months of implementing austerity measures he had once railed against, Greek Prime Minister Alexis Tsipras on Tuesday returned to his old, anti-austerity campaign rhetoric. Speaking from the southeastern Aegean island of Nisyros, he called the technocrats overseeing Greece’s fiscal adjustment programme “silly” for failing to agree on the level of austerity Greece needs to implement. Tsipras is alluding to the International Monetary Fund’s attempts to distance itself from the latest Greek bailout, which has been financed solely by the European Stability Mechanism – the Eurozone’s sovereign distress fund. In a blog post on Monday titled “The IMF is not asking Greece for more austerity’, Poul Thomsen, once the IMF’s iron-fisted overseer of the Greek programme, said that Greece needs to modernise its economy, not cut social spending further. “We think that these cuts have already gone too far, but the ESM program assumes even more of them,” Thomsen writes. Thomsen highlights the IMF’s chief disagreement with the ESM in calling for a major overhaul of Greek debt, something Eurozone hardliners led by Germany are adamantly opposed to. “Greece’s debt is highly unsustainable and no amount of structural reforms will make it sustainable again without significant debt relief,” Thomsen writes. An ESM spokesman said he was surprised at the IMF's public statement, and Greek finance minister Euclid Tsakalotos struck back at the IMF's position in an interview on Tuesday. Taking advantage of this widening rift, Tsipras has now fired a broadside against the programme in its entirety. Last week he promised to spend an additional €617mn ($650mn) on poor pensioners, although he promises to keep spending within limits agreed with creditors. On Nisyros, he promised to suspend a sales tax hike on Aegean islands, which creditors imposed on his government last year. Among those islands is Chios, which on November 30 held a one-day strike to protest against the increase of sales tax from 17 to 24 percent, in line with the rest of the country. Islands have traditionally enjoyed a few benefits because of the additional costs and hardships of island life. The hoteliers’ association of Lesvos called the hike “an unexpected gift to our competitors”. Tsipras says he will hire more than 1,500 teachers and 1,000 medical personnel on the islands. He also promises infrastructure works worth $64mn until 2020. Eastern Aegean islands have become increasingly restive over the presence of more than 16,000 migrants and refugees, who have been building up there since an EU-Turkey Statement in March. Under its terms, Turkey will take back those who do not qualify for international protection in Europe, but applicants may not leave the islands for the Greek mainland and continental Europe. This has turned places like Chios and Lesvos into a vast processing zone. Last month, hoteliers on Lesvos refused a rent subsidy from the United Nations High Commission for refugees in return for putting up migrants, fearing that the refugee industry will replace the tourism industry. Chios’ municipal council went back on an agreement to allow the government to build a massive new refugee camp on the island, demanding the refugees’ removal instead. This review was published by The Weekly Standard under the title "Unlearned lessons from the Greek financial crisis". There is hardly a member of the European Union whose past is not more prosperous, secure, expansive and influential than its present. During every age of European civilisation someone has held the upper hand, and lost it. Perhaps thanks to the maturity that comes of rising and falling, this neighbourhood of high pedigrees and inflated egos managed, after its last great conflagration, to settle into the idea of sharing its croquet lawns. That idea is now in retreat. Was the European Union a passing whim? In Defence of Europe is a work of controlled anger. Professor Loukas Tsoukalis, who chairs Greece’s pro-EU think-tank, ELIAMEP, argues that the Eurozone’s sovereign debt and refugee crises exposed potentially fatal design weaknesses and third-rate political responses, creating winners and losers. He writes from the Europe’s periphery, the ultimate loser, bringing forth incontrovertible economic data that back up a stinging accusation of the north, especially Germany. “Democracy is not a given, nor is peace,” he ominously warns three pages before the end. Tsoukalis focuses on European Monetary Union as an inequality machine. Assumptions that EMU would encourage everyone to enjoy Germany’s high trade surpluses proved wrong, because when they adopted the euro member states had diverging levels of competitiveness. In the decade preceding the financial crisis of 2008, “unit labour costs in Ireland rose by 46 percent in relation to Germany. The corresponding figures were 33 percent for Greece and 24 percent for Portugal,” he says. Exchange rate fluctuations between EU members had made up for much of the competitiveness gap by lowering the cost of exports. By nailing everyone to a fixed currency, the euro amplified Germany’s essential competitiveness, but made it much more difficult for less competitive economies to export goods and services. Nor is it only the periphery that suffers from currency overvaluation. In a recent interview, France’s far-right leader, Marine Le Pen, called the euro “a suit that fits only Germany.” She would ditch the common currency for the same reason that Greek leavers would: “The IMF has just said that the euro was overvalued by six percent in France and undervalued by 15 percent in Germany. That’s a gap of 21 percentage points with our main competitor in Europe,” she said. If she wins the presidential election next spring, an anti-establishment vote that seems all the more likely after Donald Trump’s success, Le Pen plans to recreate the “currency snake” of 1972 – a band of exchange rates 4.5 percentage points wide, within which EU members had some room for devaluation. When financial markets collapsed in 2008, they started pricing risk into sovereign bond purchases and Greece, with its high deficits and debt, was soon unable to borrow. It asked its Eurozone partners to set up a distress fund. Greece got its sovereign loan on what Tsoukalis describes as “punitive and economically unrealistic terms”. As government cut costs it created a deepening recession. Greeks began to talk of a deliberate deconstruction of their economy as part of a northern European plot to reduce them to a cheap worker class and buy up their companies. This dubious narrative had its northern counterpart. Germans talked of how the fiscal profligacy of the periphery threatened hard-won German budget surpluses should the EU allow the wealthy states to subsidise the less well off, as in the US economy. But with the exception of Greece, none of the sovereign debt crises that followed (Ireland, Portugal, Spain, Cyprus) were due to overspending, says Tsoukalis. They were caused by private debt bubbles leading to bank bailouts. The fiscal profligacy narrative, however, enabled German politicians to claim credit for German economic success as a product of political virtue, blame the periphery for its woes and justify the austerity wrought on it. Had even this been done in a burden-sharing fashion, with, say, part of the periphery’s debt being mutualised through a euro-bond, or by forcing creditors to accept at least some responsibility for their lending decisions, the political consequences of bailouts might have been less poisonous and European unity might have been preserved. But the Germans, Dutch, Finns, Danes and Belgians, with trade and budget surpluses, did it with an authoritarian, punitive and morally superior tone, partly as an example to others. Never before had European relationships been defined by the raw power of money. European institutions were also weakened by legal sleight of hand, says Tsoukalis. Europe’s fiscal rules expressly forbid government bailouts, so the institutions created to offer them operate outside EU law. Finally, bailouts came off as a German diktat to national parliaments, which are still the bedrock of European democracy. Austerity bills hundreds and in some cases thousands of pages long had to be considered in periods as short as 24 hours. Lawmakers were in each case told by German and EU officials that failure to pass a bill would result in emergency loans being stopped, and national bankruptcy. “How much economic sovereignty (or democracy) can you afford if you are bankrupt?” has become a key question in Europe. Tsoukalis’ consternation by numbers supports the periphery’s view of European economic policy with data and argumentation. In effect, he tells the losers of Europe that they are right to be angry - and why. Despite its shortness, this is a dense work, but the student and observer of Europe will find it an invaluable resource. In retrospect, Germany’s comportment in Europe - forcing acquiescence upon others to divisive and often questionable policies – goes back to German reunification. At the European Summit of December 1991, Germany muscled through recognition of Croatia and Slovenia, which had declared their independence, ignoring warnings that this would prompt the breakup of Yugoslavia, which it did. After an eight-year civil war, which Europe did nothing to stop, Germany participated in the NATO-led bombardment of Serbia and Kosovo – its first military action abroad since the end of the Second World War. Germany’s Yugoslavia policy marked the first manifestation of her new persona – more assertive, prepared to take a leading role in Europe, but in the national rather than the collective European interest. Now Germany, along with other creditor countries in Europe, has hijacked European economic policy with purely national priorities. It is tempting these days to think of the EU as divided along cultural lines. Germany can put herself at the heart of a resurgent Holy Roman Empire consisting of her supply chain countries and Teutonic affiliates. It is a Standard of Living Union, fundamentally different in outlook from countries like Italy, France, Greece, Cyprus, Spain, Portugal and Malta, which thanks to good climate and rich history can claim only a Quality of Life Union. If the EU is to have force on the world stage as a political entity, fiscal union, greater redistribution of wealth, a defence and foreign policy and a constitution must be on its agenda. In reality, both the self-proclaimed federalists and the new wave of populist separatists are pulling in the opposite direction. A Greek election in 2017? The Eurozone’s biggest economies, France and Germany, hold elections next year. So may Italy, its third biggest, if a government formed out of the present parliament cannot hold. Greece, in recent years the Eurozone’s politically most unstable country, may now be vying for a place in the pack, adding to the shifting political parameters of 2017. That, at least, is how some observers are interpreting Prime Minister Alexis Tsirpas’ decision to hand out €700mn in concessions for low-income pensioners on December 8. The announcement followed a Eurogroup meeting in which the ruling leftists failed to win more than short-term debt restructuring, leaving to 2018 the more substantial measures Greece needs to be viable. The reasoning is that with the 2017 budget now safely passed in parliament last weekend (along party lines, with one defection) and Syriza fast running out of political capital following its failure either to restructure the debt or to enter Greece into the European Central Bank's quantitative easing programme, it is time to let the conservative New Democracy assume the mantle of austerity before Syriza loses any hope of re-election in future. Syriza, which was returned to power in September last year, theoretically has until 2019 to run. Papadopoulos acknowledged the “many tens of billions of euros” spent by European taxpayers to raise the Greek standard of living through European Union subsidies; but he blasted the European Union for postponing a resolution of the Greek crisis until after 2018, something he called “a grand deception on the part of the Europeans”. Steady rate of repayment: Greece still owes €131bn from its second bailout loan, which matures in 28 years. This will be extended to 32.5 years. The effect of this extension is that Greece will pay a bit more in interest, but it will face no “repayment humps” – years in which its annual premium is set to rise sharply. 2. Steady rate of interest: Greece’s first and second bailout loans carry a floating interest rate. That is fine in the current environment, where the European Central Bank’s base rate is zero. This has enabled Eurozone countries to lend to Greece at rates, which now average below two percent; but market conditions could change over the next 32.5 years, so the ESM will alleviate that risk by swapping Greece’s floating rate bonds for fixed rate bonds in order to lock Greece into current, low market rates (the precise rate is subject to a negotiation between Greece and the ESM). It will also offer any future loans to Greece on this fixed rate. In this way, the ESM acts as a shock absorber between Greece and the market. 3. No stepped-up interest rate: Greece’s second bailout entailed an interest rate step-up of two percent for debt buy-back. This would start being charged in 2017, but is now being scrapped, at a cost of about €200mn to European taxpayers. What these measures will ultimately do for Greece’s debt sustainability is not certain, but ESM chief Klaus Regling thinks they will lower Greece’s debt-to-GDP ratio by roughly 20 percent between now and 2060. No one is pretending that this is a breakthrough. Greek Finance minister Euclid Tsakalotos called the Eurogroup “intriguing and interesting” and its result “very promising”. Regling stressed that these are only short-term measures, and that anything more ambitious will have to wait until mid-2018, when Greece’s current bailout period ends. If anything, Greece has been reminded of an onerous undertaking in the Eurogroup statement, which recalls that, “the primary surplus target of 3.5 percent of GDP reached by 2018 should be maintained for the medium-term.” This means that Greece has committed to setting aside a sum equal to 3.5 percent of its economy with which to repay debt in 2018 (it is set at 1.7 percent for next year), and creditors expect it to continue to bleed its economy at that rate for several years thereafter. No one has said exactly how many years Greece will be asked to do this, but off-the-record estimates vary between three and ten. This is a problematic premise. In its debt sustainability analysis last May, the International Monetary Fund said it didn’t think Greece could achieve the 3.5 percent level without politically impossible sacrifices. It confirmed that view on December 5. Furthermore, the IMF said in May, “Even if Greece through a heroic effort could temporarily reach a surplus close to 3.5 percent of GDP, few countries have managed to reach and sustain such high levels of primary balances for a decade or more, and it is highly unlikely that Greece can do so considering its still weak policy making institutions and projections suggesting that unemployment will remain at double digits for several decades.” Instead, the IMF said, creditors should work on the assumption of a primary surplus of “no more than 1.5 percent of GDP”, this lying in the IMF’s view “within the realm of what is plausible”. This analysis is based on the fact that Greece’s political elite is now provably pitted against a fast pace of reform, and its banks so overburdened by non-performing loans that they won’t be able to finance much new business. Growth is therefore bound to be sluggish – as indeed it is in the Eurozone as a whole. So what is the IMF’s proposed solution? All of the measures the Eurogroup adopted this month are based on the IMF’s May proposals, but they are partial implementations. For instance, the IMF proposed that Greece’s first and third bailout also be included in the extension of the repayment period (another €113bn). Regling’s proposals extend only the second bailout (131bn). The IMF also proposed low, long-term, fixed interest “not exceeding 1.5 percent”. The goal, the IMF said, was to achieve a 50 percent fall in debt-to-GDP ratio by 2060 if Greek debt is to be considered sustainable, not the 20 percent fall Regling says will suffice for now. Why has the ESM chosen to focus on the short-term relief instead? Syriza did attempt to redefine Greece as insolvent, rather than just illiquid, in its first six months in office. In other words, Syriza said Greece needed an overhaul of its finances, including generous debt forgiveness, rather than constant cash injections that keep its economy alive but bedridden. This attempt famously failed, because under German leadership the Eurozone does not want to spend-and-stimulate its way out of members’ sovereign debt crises, but encourage them to save their way out, hence the policy of austerity. This is the guiding principle of the ESM’s short-term measures - that Greece’s nominal debt ultimately doesn’t mater, only its ability to service its debt, and the ESM is prepared to lend Greece just enough to achieve the latter. But this logic goes against the founding principle of austerity, which is to bring Eurozone economies back in line with the terms of the Stability and Growth Pact. That allows a debt-to-GDP ratio of no more than 60 percent. Greece has had to accept that what Regling and Berlin say, with all their contradictions, is the reigning logic in Europe. During his annual keynote speech on the economy at the Thessaloniki International Fair last September, Prime Minister Alexis Tsipras didn’t even mention debt restructuring as a national priority. Instead, he talked of Greece’s one day being included in the European Central Bank’s quantitative easing programme. Under Regling’s proposals, Greece will try to lock the €131bn it owes under its second bailout into a low interest rate of, say, just over one percent. That will represent one of the lowest rates of interest it has ever paid. It's a start. It may be that this softer approach to a debt deal is producing better results than Syriza’s high-profile, head-on approach during its first six months in power. But unless Germany ultimately agrees to a fuller debt restructuring, these interim measures will be pointless and expensive to the Greek taxpayer. The IMF and the Eurogroup agree that at present, Greece's debt will be around 250 percent of GDP in 2060. Can Greece export stability for debt relief? Italy's referendum upset, four months after Turkey's coup, puts Greece between two politically unstable or unpredictable countries. The Eurozone's basket case is by comparison a relatively stable factor in the region. Despite their troubles, Greeks have elected to stay in the Eurozone and, however imperfectly, work with Europe. German foreign minister Frank Walter Steinmeier committed to improving relations during a visit to Athens today. Barack Obama lauded the Greeks for staying the course of reform and European unification despite the difficulties during a visit on November 15-16. These are points marking a gradual shift in Greece's image and outlook, but does it mean that premier Tsipras can cash in this stability for the debt restructuring he wants? There is a partial answer in today's Eurogroup, where the head of the ESM, Klaus Regling, will present some proposals for short-term debt relief for the Greeks, beyond what the May Eurogroup already approved, but short of what the Greeks want. EU finance commissioner Pierre Moscovici also voiced confidence last week in Greece completing the second review of its third bailout loan before the end of the year. European rhetoric towards Greece has alternated between the polemic and the reassuring over the years of Greece's crisis (2010-present), but it has been more consistently reassuring this year, and is becoming increasingly so. Perhaps European mainstream political forces, which are pro-Europe, are beginning to understand the damage austerity has done to the European cause. But the Greeks shouldn't overestimate the cash value of standing still. Europeans still expect reforms and efforts at convergence. 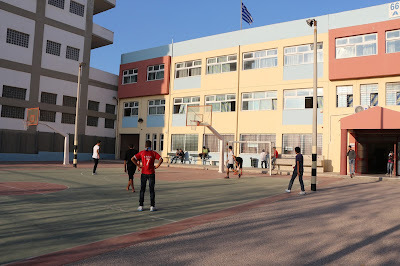 A bystander outside the 66th Middle School of Athens nowadays witnesses two events when the bell rings at 2pm: scores of Greek children pour out of the three-storey building onto a asphalt football pitch, and out of the school gates. Silence descends for about 20 minutes before coaches pull up and disgorge dozens of refugee middle schoolers. They are barely distinguishable from their Greek colleagues. Boys and girls band together. They wear the jeans, sleeveless duffle jackets, sport shoes and backpacks universal to 13-15 year-olds. There is not a headscarf in sight. The enthusiasm is evident to anyone familiar with the feigned boredom of youth. 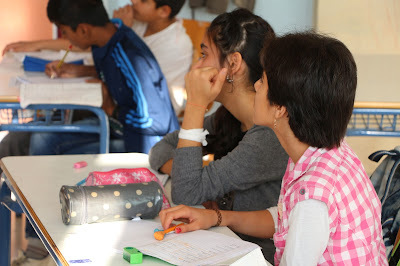 Refugee students spring out of their seats to race each other in long multiplication on the blackboard, and the class cheers them on. When called upon to read the months of the year in English, a small class of Syrians, Afghans and Iranians eagerly takes turns. “You’re not going to have bored kids in class. They are kids who make demands, want things and are motivated,” says Alexandra Androusou, a professor of education science at Athens University, who helped draft the education ministry’s after-hours programme for refugees. Androusou led teams of her university students in a yearlong project at the Elaionas refugee camp, from which the 66th school draws its students. They witnessed the refugees in a much more raw state. For instance, at first many parents didn’t let their children out of their mobile homes. The team took some 70 children, aged 5-15, under its wing. There was no common language. Many had never been to school and couldn’t draw straight lines with a ruler. They ripped the paper they were given. Collaboration on group projects was next to impossible. 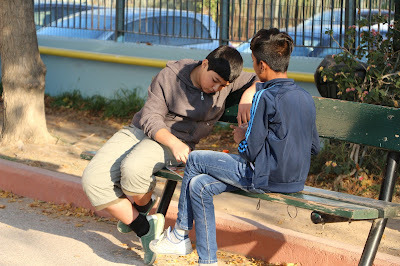 By playing games, the team gradually formed a relationship of trust and began to introduce Greek and English words. It also instilled basic discipline. “The children needed rules and boundaries and wanted them…. because boundaries at this age allow creativity, they allow access to knowledge,” says Androusou. By the end of the year the children were able to arrive on time, follow instructions and accomplish group art projects. Androusou proudly displays a sculpted column of clay on her desk as the pinnacle of this learned collaboration. Greece now has a standing population of about 60,000 refugees. At last count, 38,000 were asylum seekers, and many have applied to move elsewhere in Europe. Staffing shortages and constant new arrivals mean a long wait before their cases are decided. This means that an estimated 20,000 children are going to spend some or all of the current academic year in Greece. 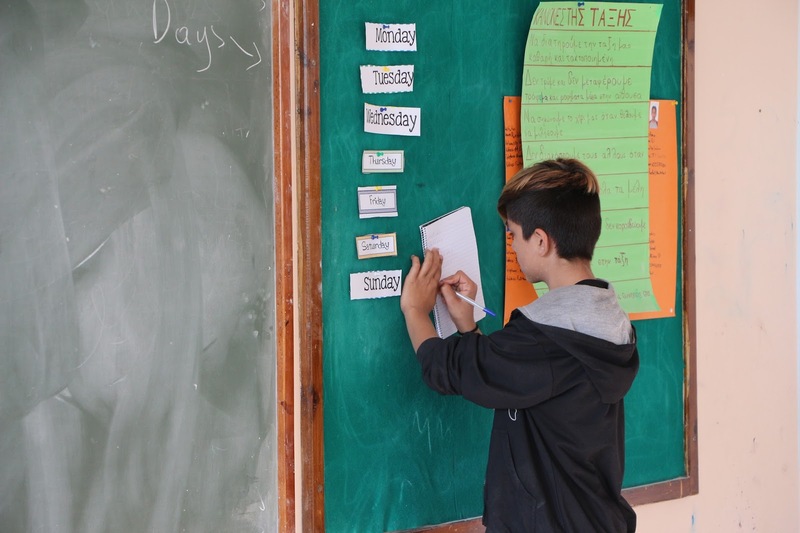 When the Syriza government announced its intention to educate those above the age of six – about 14,000 minors - it produced uproar in parts of society. Critics of the plan raised the question of money; but the programme, estimated to cost a little over €21mn, is being funded by the European Union and is providing some 800 part-time jobs to Greek teachers. Of greater immediate concern was the issue of hygiene. In the past few years, refugee and immigrant populations have helped bring back malaria and tuberculosis, which had been so marginalised by vaccination and spraying for mosquitoes that medical schools couldn’t find subjects to teach their effects. Ilias Papastavrou, the headmaster of the 66th school, met with parents to tell them that their school would operate an after-hours refugee programme. “They wanted to know that the refugees will be vaccinated, as the law stipulates for Greek kids as well," he says. "They wanted to know that the school would be cleaned after the evening programme to be ready to admit the Greek kids in the morning." Many reactions were worse. Last September, parents at the Panorama district of the northern port city of Thessaloniki occupied their children’s school so that refugees could not enter. In Volvi, north of Thessaloniki, parents refused to send their children to school at all until they were threatened with a court order. On the island of Chios, activists conducted a poll on whether refugees should be allowed in their schools, even though no such policy applied there (the eastern Aegean islands are a legal frontier under this year’s EU-Turkey Statement, not an area of residence for refugees, and the government is not offering them education there). Despite the reactions, the programme, which includes Greek, English or German, maths, computing, sport, music and art, is now being taught in 37 schools nationwide. 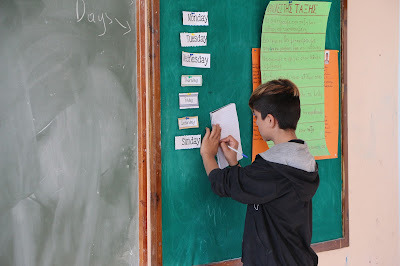 Hundreds of refugee children living in squats and UN-sponsored rentals in central Athens have also enrolled in regular morning school, even though they don’t intend to stay in Greece. “Some parents don’t want their children to learn Greek because we don’t need it,” says Somaya Suleiman, a Syrian mother at a squat in a disused school building in central Athens. The problems refugees encounter, beyond the academic, are emblematic of broader, European concerns. “Some people are afraid of me when they see we have [the] hijab,” says Mazia Jemilli, a remarkably articulate 15 year-old Afghan who plans to be a neurosurgeon. Jemilli says she has also encountered religious prejudice at her multicultural high school at Hellenikon, a southern suburb of Athens. Multicultural schools were established for the children of eastern European refugees after the fall of communism, but are now increasingly filled with Afghans and Syrians. Her school holds an organised morning prayer for Christians, but not for Muslims. She suggested rectifying this. The school has so far refused, on the grounds that it has students adhering to five religions. Refugees were a moving body of humanity throughout 2015. Last February, the police forces of Austria and the former Yugoslavia closed the Balkan route that allowed them across as many as six borders to Germany. Once they became a standing population, they were put into disused army camps, out of sight of most people. Enrolment in school is now making refugees visible to society. Although the Greek school experience is largely a success, neither Greeks nor refugees forget that work, the ultimate integrator, will be the greater problem in Greece’s recessive economy. “Even if they appreciate the fact that as a country we have accepted them as warmly as we can, they know they have no future here. There are no jobs for them,” says Elli, a Greek volunteer. KEA, Greece - A hundred years after she sank in the Aegean, Titanic’s sister-ship is shedding light on what sent the doomed ocean liner to the bottom of the Atlantic and creating a new diving industry in Greece. Britannic was serving as a World War One hospital ship when she struck a German mine five kilometres off the island of Kea, 60km southeast of Athens, in November 1916. She sank in just 55 minutes. As the centenary of that sinking approaches, applications for diving permits have soared and the Greek government wants the 49,000-tonne wreck, the largest in the world, to become the centerpiece of a series of marine museums across the country. “[It] will be the first underwater historical museum in Greece with international importance,” says Angeliki Simosi, head of Greece’s underwater antiquities department. The reason for this is that Britannic may hold the key to how and why Titanic sank four years before her. Britannic’s keel was laid just five months before Titanic was launched at the Harland & Wolff shipyards in Belfast. 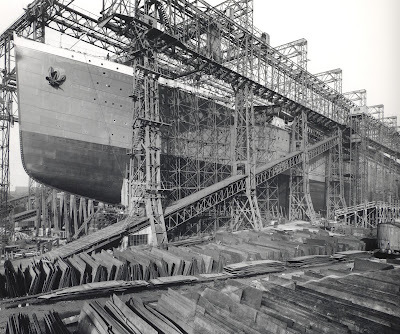 She was barely taking shape when her older sister went down, and the disaster threw the shipyard into a crisis of confidence. Some of those design changes are well known. 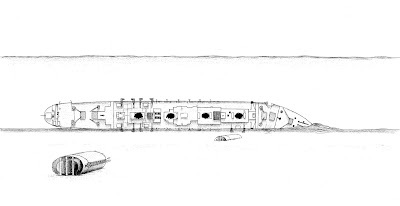 Titanic’s double hull only extended across the bottom of the ship, defending the deep-drafted vessel against scraping the sea bed. The iceberg cut her just below the waterline where her skin was vulnerable. 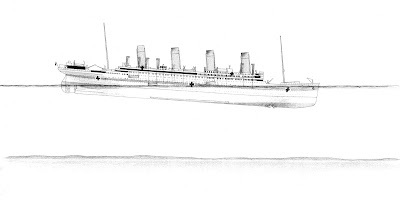 Britannic was widened by half a metre so that a double skin could be installed along two thirds of her length, protecting her boilers and engine rooms. As Titanic flooded, the water rose to overwhelm the bulkheads separating her compartments, spilling into one compartment after another. Britannic’s bulkheads were raised all the way to the bridge deck. 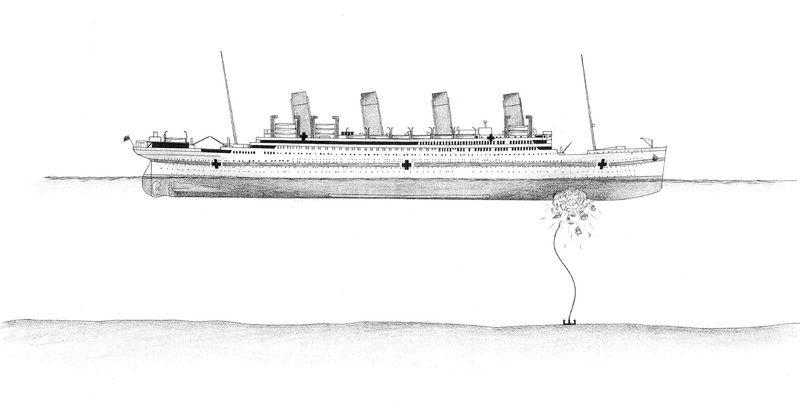 Most important of all, Britannic rectified the lack of lifeboats on Titanic. Four enormous gantry davits were added to her decks capable of launching 44 lifeboats on both sides of the ship simultaneously. 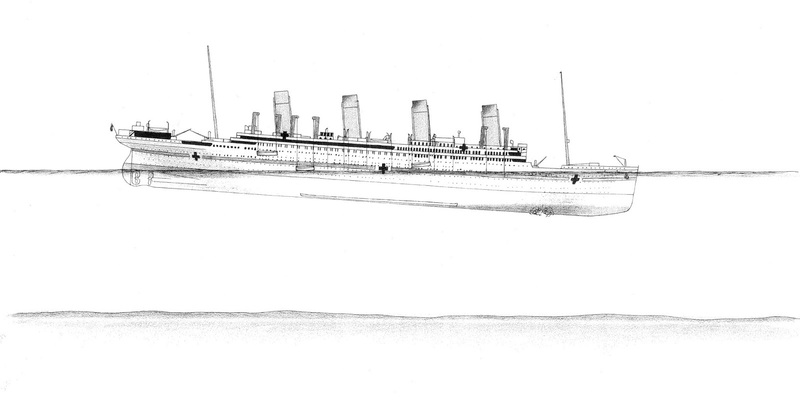 “Britannic would have survived the damage which the iceberg inflicted on the Titanic,” says historian Simon Mills, who bought the wreck of Britannic 21 years ago; but Kohler and his team discovered an additional, more subtle improvement, which may suggest that the builders had deeper concerns that Titanic may have been doomed due to a design flaw. During British and American inquests into Titanic’s sinking, the question was raised whether she had broken up at the surface. The reports were inconclusive. In 1986, oceanographer Robert Ballard discovered the Titanic on the Atlantic sea floor, and found that she was indeed broken in two. “Where did Titanic crack in half? Right at an expansion joint,” says Kohler, who was on Ballard’s expedition. 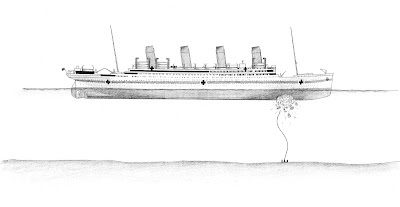 The design change may suggest that while Titanic and Britannic were meant to stay afloat with six compartments flooded, Harland & Wolff may have suspected that their expansion joints couldn’t withstand the stress of having one half of the ship flooded and the other buoyant. “At about 15 degrees [Titanic] went from being intact to breaking apart,” believes Kohler. 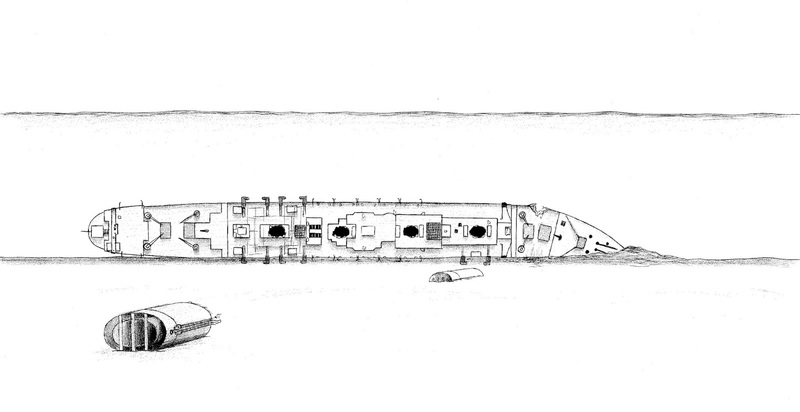 The admiralty’s official report of the sinking says, “There seems to have been a period of one to two minutes from the time of the explosion until the water in the stokeholds was too deep for work to be performed.” In other words, the massive boilers in forward holds 5 and 6, an area measuring 10.6m x 27.4m, were overwhelmed almost instantaneously. "The mine hit in the worst possible place at the worst possible time. All those watertight doors down below were open because they were changing watch at eight o’clock in the morning. Those doors should have been closed,” says Mills. In his own report of the incident, captain Charles Bartlett says orders were “rung below to close water tight doors.” This should have prevented the cross flooding of the holds. “For some reason, the doors in the forward part of the ship didn’t close,” says Mills. Even if electrical switches failed, the doors had manual levers. Failing that, a float mechanism should have triggered them. 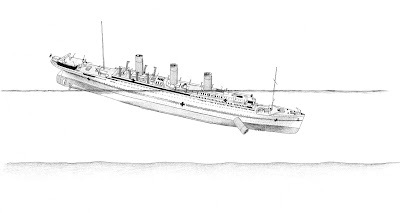 Between the Burdigala and Britannic, at just 35 metres, lies the Patris, a Greek storm-sunk steamer with one of its paddle wheels still in place. All are to become part of Kea’s network of underwater galleries. “Mass tourism isn’t interested in small destinations. If a place can show that it has a different profile, then it can claim a piece of the market,” says mayor Yiannis Evangeliou, who has spent four decades in the tourism industry. He plans to go further, and create a marine wildlife park for less experienced divers. Britannic had her own tragedy. As she evacuated a thousand crew members, Captain Bartlett tried to beach her on Kea. The ship had already begun to list to starboard, and the port propeller hung half out of the water as it roared to life. “Two boats were pulled into the turning propeller and they were smashed to matchwood. 30 people were killed and 30 or 40 were very seriously injured,” says Mills. Yet this pinnacle of Victorian technology was rapidly overtaken by events. 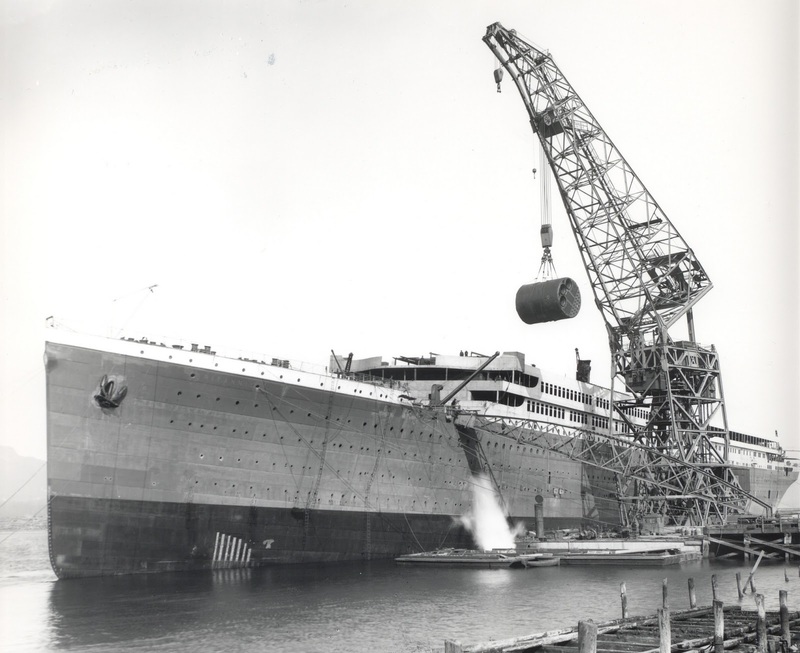 She never served as a passenger liner. Her life as a hospital ship lasted a mere 11 months. Britannic, perhaps more than any other physical thing, lies as a testament to how shockingly and irreversibly the Great War changed the world.